WØEA Blog! : Batteries for the KX3? Looking through the stats for the blog, I noticed a couple of Google searches that lead people to my blog were regarding what the best batteries for the KX3 are. I am by no means a battery hoarder or expert but I can certainly talk about what I have used. In the lead up to the deliver of my KX3, I was pretty sure I wanted something cheap but with enough power to provide a couple hours of operation at the park. Rarely would I need anything more substantial than that and I already had a 7aH SLA if I needed it. The obvious options were NiMH rechargables which could be used internally with the KX3 or a LiFe (Lithium Iron polymer). 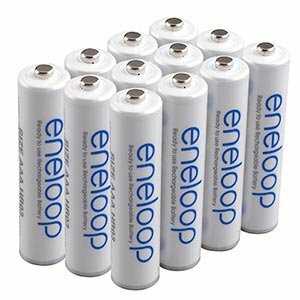 A set of 8 Sanyo Eneloop "Low Self Discharge" NiMH batteries that provide 2100mAh of power run about $20 and can (or will be able to be) charged with the KX3's internal charger. You probably already have a battery charger that will charge them until the KX3's ships. I also ended up buying one of the fancy individual cell chargers since I did not have any "slow" chargers which you should use when charging any NiMH battery to prevent overheating and excessive stress on the cells. So total cost was about $40 and I get some 1,000 charges out of these batteries. The 8 cells weigh about 250 grams (not verified) and based on actual usage in the field, provide 2+ hours of casual portable operation at 5w (not talking contesting here). It is important to note that the 8 cell pack does NOT allow you to operate at the KX3's full power output of 12w due to the supply voltage being below 12 VDC. This was not a problem for me as I am a QRP purist but it may be to you. Be warned! In summary - I think the Eneloop batteries work great for my particular use scenario. Now I began looking at LiFe batteries lately as well. LiFe batteries provide a much flatter discharge curve which means they can generally be used for longer period of time at the same current discharge than NiMH batteries. Since I had been happy with the power and weight that the Eneloops have provided, I decided to look for a comparable LiFe battery. The closest comparison is the 3s2p configuration which provides about 9.9VDC. A 2100 mAh size runs about $14 from various RC hobby shops, however you will absolutely need a special charger for these types of batteries, which runs about $20 depending on which one you get. So in total, the cost is very comparable. Now the part that surprised me was the weight. I had always been under the impression that Li batteries were much lighter than their counterparts but at this smaller capacity, this is not the case. the 2100mAh LiFe battery runs about the same weight as the 8 NiMH cells I already have. The power density savings does, however, come into effect at the next step up, the 4s2p battery which provides 13.2VDC (i.e. 12w output!). A 4200mAh 4s2p battery weighs only 500 grams and would provide a lot more operating time, at a higher power, than the 3s2p. But then, I don't really need that much power or time to operate and the cost is 2x as much than the 3s2p so I've passed on that one. In summary - If you need the higher power operating options, LiFe is a no brainer. For me, LiFe batteries provide nothing I don't already have in my NiMH set, except maybe extended operation but even then, I have yet to operate long enough to run my NiMH batteries out. So I hope this helps a few folks who stumble across my blog get an idea of what the options are. I'm sticking with my Eneloops. Good morning TJ, I too have been looking into some AA NiMH's for my KX3 as well. I came across Ansmann batteries they come with a 2 year warranty and have a rating of 2850mAh's to them. I also was checking out the Sanyo 3uwx rated at 2500mAh's. I think I am going to go with the Ansmann as they have very good reviews and seem to be a very solid battery as well regarding their spec's.